Bula Vinaka and Welcome to Fiji Golf Club home!! 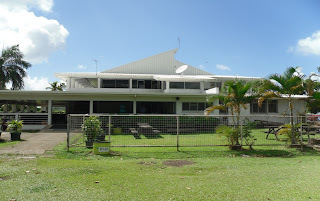 The Fiji Golf Club is located along Rifle Range Road in Vatuwaqa suburb, Suva, which is the Capital City of Fiji Islands. The Club was designed and built in 1908. It hosts an 18-hole golf course, which is built on a 41-acre (16.7 hectares) flat land. The club has a membership of over 550 members, who come from different races, ages and walks of life. It is a public golf club, which is about 15 minutes drive from downtown Suva City main shopping area and major hotels. The city offers reliable public taxi services, which are available 24-hours a day. A return taxi fare to the club house is about $F10.00 (US$5.00). The club fronts the Pacific Ocean at Vatuwaqa. The first nine holes run basically along the sea front, while the second nine faces Nabua suburban shopping Centre and residential areas. It also offers ocean, island & mountain views! The Club house is a 2-story building, which has top and ground floors. The top floor is used for recreational services. It can also be hired out for private functions at a nominal fee. The ground floor accommodates a licensed Bar, Pro shop, a billiard table and a kitchen for snack foods and plenty of sitting area with well equipped furniture and friendly Staff. The Club Pro shop offers a full range of retail & rental golf equipment. It also offers a 24-hour secured car parking area at no cost. The club has two resident professional golfers, who are available 7 days a week for professional coaching/lessons for a nominal fee. Club weekly competitions are held every Saturday. Tee off time is between 8.00 am – 12.30 pm. Entrance fee is $F10.00 per player. In addition, non-members are required to pay $F green fees, which is also payable on non-competitive days. There is also annual Summer Cup weekly competitions, which is sponsored by DATEC Fiji Ltd. The Summer Cup is played during off season on 31st January – 31st March, inclusive. It attracts a great number of golfers, who pay $F10.00 entrance fee per game. The club also runs a 9-hole weekly Chook Run competition at 1.00 pm – 4.00 pm on Fridays. Entrance fee for the Chook Run is F$5.00 per player. These events are sponsored by Goodman Fielder International (Fiji) Limited. Visitors are most welcome to participate in these events. In addition, Fiji Golf Club Ladies also have ladies’ weekly tournaments on Tuesdays, teeing off at 1.00 pm. Men and women visitors are also welcome to join the ladies. Non-financial members of the Fiji Golf Club or visitors are required to pay $F green fee, if they wish to play in the above competitions. Green fee is also payable on non-competitive days. There are great opportunities for visitors to meet our members over a few refreshing drinks at the 19th hole in the newly renovated club house and enjoy the real Fijian hospitality after a game of golf. The club is opened 7 days a week. Social games can be arranged on non-competition days. No formal booking of the course is required. Men must wear pair of shorts or long trousers and golf t-shirts with a collar. Women must wear a long pants or shorts at appropriate length and shirts with sleeves. Golf shoes with rubber spikes are preferable. So if you are in Suva, Fiji islands for business or leisure why not take the opportunity for a game of golf and join us to experience the real Fijian hospitality. To find more about us, please call us phone: +679 3382872 or email: fijigolfclub@connect.com.fj . Our friendly staff are always willing to assist. Thank you for visiting us. We look forward meeting you soon during your visit to Suva, Fiji Islands.